After a long day hiking the ruins and the Sun Temple in Ollantaytambo, we gathered in a local lodge down the lane from our own. The white walls were adorned with Peruvian art. We sat on the wooden floor. We had come for a despacho, which is an ancient religious ceremony in which offerings and prayers are made to Pachamama (Mother Earth). We had eaten dinner, night had fallen, and we were exhausted. Given the hour and condition of the students, I wasn’t sure how it would all play out. I worried that we wouldn’t be totally present for the ceremony. 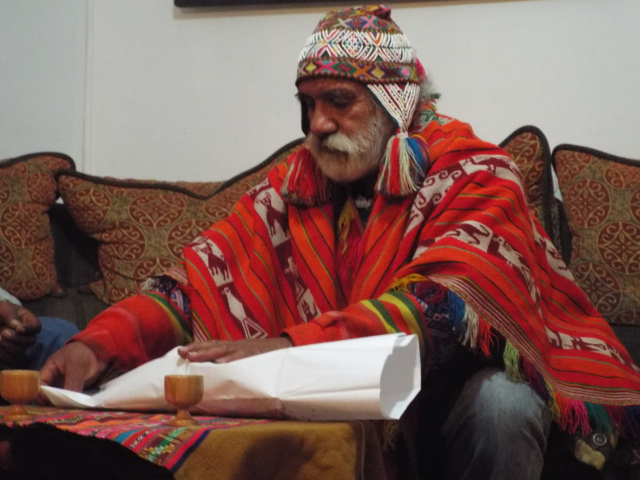 The despacho is performed by a shaman. Our shaman was named Vidal (a name which made me immediately think ‘Sassoon!’) and he was dressed in a vibrant red poncho over faded jeans, and wore a multi-colored woven hat with beads and tassels. He had a mostly-white beard, a resonant voice, and a chiseled face of importance – but one with a smirk. It was hard not to be amused by his get up and demeanor. Please pardon how disrespectful that sounds, but he was a character in the best sense of the word. He sat on a couch before us with another man who appeared to be his assistant. Before the despacho ceremony began, Vidal talked (and talked) to us. Maria, my colleague on this adventure, is well-trained in performing despachos herself and translated his words for the students. He imparted messages about returning to our spiritual selves, about our connection with the earth and our relationship with each other. “Todos son Indios” – we are all Indians, he said. He made an interesting play on these Spanish words while he was speaking on this topic: he repeated that we are all “In-Dios, en-Dios” meaning ‘in God’. This is familiar language to me as a Quaker; there is the Light of God in all of us. He spoke at length about the condor, a representation of the divine and a sacred symbol for Andeans. He meandered through topics, sounding off on the many ways westerners have lost their way by losing touch with the Earth and nature. We concentrate on the wrong things, on material possessions and wealth. We’re destroying the Earth. We don’t listen to our inner selves, each other, and nature. He wasn’t wrong. But he repeatedly called us donkeys in English which first elicited chuckles, then silence. I could see that we were all thinking, “That dude is calling us asses!” The wandering speech and not-so-subtle insults made us fidget and wonder where it was all going. Some of the students seemed to be tuning him out, as was I, to be perfectly honest. After about 45 minutes the ceremony began. He became more solemn and adopted a serious tone. Students perked up. He explained the despacho. We were there to pray and make offerings to Mother Earth. We were there to ask for something and to give something. This was important what we were about to do, and we felt it. A bag of coca leaves was passed. [It should be noted that the coca leaf is part of nearly everything in Peru. It is used to make tea to cure all kinds maladies including altitude sickness, headaches and bellyaches, to aid in digestion. The locals chew it like gum, and it is also part of sacred ceremony.] Each of us was instructed to find four perfect leaves – ones that were whole, dark green, with strong spines. Then a bag was passed with tiny waxed paper packets, each containing symbolic ingredients. We each selected a packet. The Inca believed in the concept of Ayni – that you don’t ask for something without giving in return. Reciprocity. The coca leaves would represent our prayers and wishes and the packets would be our gifts to Pachamama.We would deposit them in the prayer bundle. I was surprised (as was Maria as a practitioner) that he asked us to say our prayers aloud. Usually prayers are made silently. Before I knew prayers were to be made aloud, a distinct prayer had come to me. It was for my younger daughter who had been struggling with various things. I was terribly worried about her; her face was clearly in my mind as was my prayer for her. When he declared that the prayers would be aloud, I abandoned my prayer feeling that it wasn’t right to expose her in front of students. But I kept that prayer in my heart nonetheless, and my chest began to pound with emotion. This feeling caught me off guard, I guess because I’d not taken the whole thing seriously until this moment. This was clearly true for the students as well. Their expressions changed. The fidgeting stopped. As we selected our leaves and packets Vidal continued to speak. His voice was mesmerizing. Then he invited us to him. One by one the students approached the shaman at his mesita, a small table with a cloth in which to collect our prayers, two cups and other symbolic items. Each was asked to say his or her prayer. Vidal received the leaves, placed them upon the cloth, heard the prayer and gave a response, sometimes even a humorous one. I won’t recount what the students asked for, as many prayers were quite personal. Several shed tears as they offered their prayers, overcome with emotion. When it was my turn to deposit the coca leaves, I asked for the happiness of my daughters. “Espero por la felicidad de mis hijas,” I said. This general prayer I said aloud, but in my heart I said, “I pray that you find your way” to my youngest daughter. I didn’t realize until I stood before him how profound an experience it would be. He whispered words of encouragement, said that my prayer was kind, and assured me that my wishes would be granted. I returned to my spot in the circle, trembling and shaken by the moment. My eyes had welled with tears. Next, we individually brought our small packets to the shaman. He opened each to reveal things like flower petals, spices, wafers, leaves – items that symbolize love, happiness, health, prosperity, peace, and others. 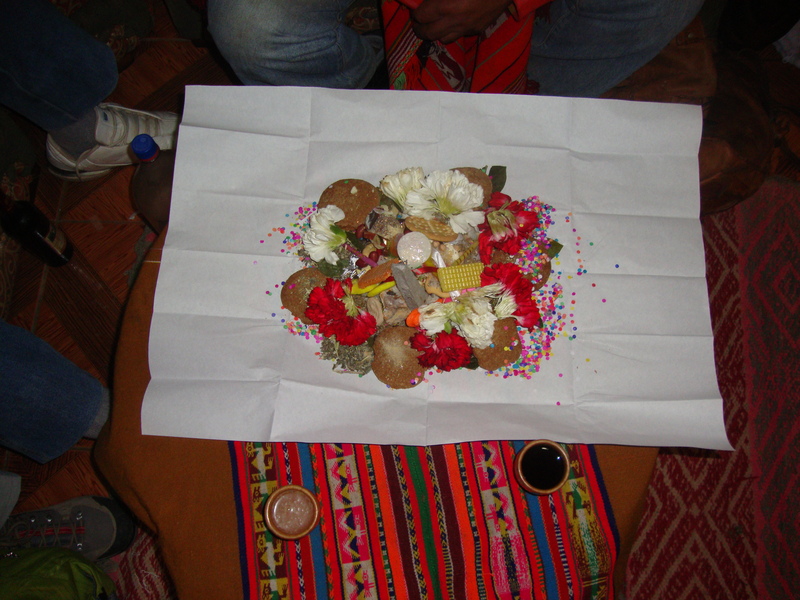 These were the offerings for Pachamama, her gifts to grant our wishes. Once our prayers and offerings were complete, Vidal gathered up the sides of the cloth and tied them together to make the prayer bundle and closed the sacred space with a prayer. We went outside where a fire had been built over a chakana, an Inca cross-like symbol. We encircled the fire and the shaman recited his prayers and placed the prayer bundle on the fire. As it took to flame, the girls (and we women) were given chicha, a corn beverage, to pour on each of the four points of the chakana and the men and boys poured wine on points that represent the three worlds: Hana Pacha, the superior world of the gods, the sun and the moon; Kay Pacha, the world of existence; and Ucu Pacha, the underworld inhabited by the spirits of the dead. We quietly poured and passed the bottles between us as the blaze and smoke rose toward the sky. At the completion of the ceremony, the shaman bid us farewell. It had grown late in the night and we were spent, but we stayed at the fire to have a Meeting for Worship, in our own tradition of reflection. We worshiped in silence as the fire crackled and lit our faces. We let the experiences of the day sink in. We sat deep in thought. I can only imagine what the students were thinking about, but I was thinking about how lucky and grateful I was to be in Peru. As with Quaker tradition, we turned to neighbors to shake hands to signal the end of Meeting. We shuffled quietly back to our own lodge along the darkened dirt path, illuminated by our headlamps. Students who had shed tears were hugged and comforted by others. The genuine tenderness they shared with one another filled me with a deep sense of peace and happiness. We fell hard into our beds that night, our bodies heavy with fatigue, our heads heavy with sharing such an intense experience, and our clothes smelling of smoke. I drifted into peaceful slumber wondering if our prayers would be answered by Pachamama. It’s been several months now since the despacho. As the experiences in Peru became memories and the routines of life returned, the significance of that night faded. But all the while, my daughter, for whom I made the secret prayer, has undergone remarkable changes and her circumstances have improved dramatically. Both of my daughters are wonderfully happy. I hadn’t attributed their happiness specifically to this experience until my dream revived my prayer and I saw their faces floating above the mesita. It could be coincidence, of course. Dreams are often random conflations of imagery and feelings. But I began to wonder: was it the power of the despacho? Did Pachamama answer my prayers? Perhaps it is so. Gracias, Pachamama. This entry was posted in Uncategorized and tagged despacho, peru, shaman, travel. Bookmark the permalink.